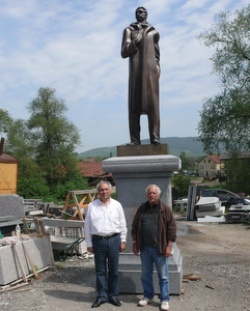 The bronze monument of the most prominent Bulgarian writer Ivan Vazov is on its way to be inaugurated in the Italian capital Rome May 21, 2010. The decision to open a monument of Ivan Vazov in Rome was made by Italian Prime Minister, Silvio Berlusconi and Bulgaria's Culture Minister, Vezhdi Rashidov, during Berlusconi's visit to Bulgaria in October 2009. The monument will be located on the Thorvaldsen square in Rome, near Villa Borghese. The 2.6-meter sculpture is authored by Professor Velichko Minekov. It will be opened formally by the Bulgarian PM Boyko Borisov, Culture Minister Vezhdi Rashidov, members of the Bulgaria PM's delegation and Rome mayor Gianni Alemanno. The ceremony will be connected with the celebrations of Bulgaria's national holiday May 24, the Day of Slavic Script and Bulgarian Culture and Education. The money for Ivan Vazov's monument in Rome has been donated by Bozhidar Petrakiev, owner of the supermarket “Elemag-Gourmet”. “It is a privilege for me to be a contributor for such a patriotic act,” Patrakiev said during his meeting with Rashidov February 4. The local authorities in Rome gave their final approval for the erection of the monument of the most prominent Bulgarian writer on January 19, 2010.